When it comes to gaming peripherals, you know for sure that a company such as Razer is right there at the top of the list to be considered by gamers. I clearly remember how the original Razer Boomslang caught my attention back in the days when I was using a Logitech ball mouse, and boy was it a looker! 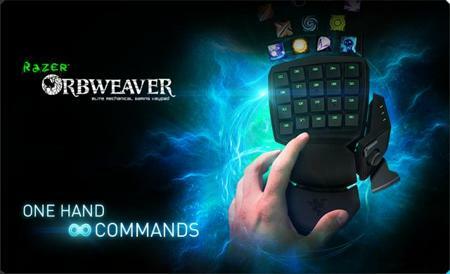 Well, Razer has graduated to many different kinds of gaming peripherals since, and this time around, we are privy to the Razer Orbweaver mechanical gaming keypad which intends to offer you an edge in executing your in-game commands, so much so that you will always remain a step ahead of the competition. Razer Orbweaver, in a nutshell, is a fully customizable mechanical gaming keypad that features adaptable ergonomics for maximum control, sporting tournament-grade controls which would definitely put any worries of it not being able to withstand the rigors of adrenaline pumping gaming for hours on end. The Razer Orbweaver will continue from where its predecessor, the Razer Nostromo, left off, as it allows gamers to gamers bind a virtually infinite number of controls to 20 mechanical keys as well as a programmable eight-way directional thumb-pad. All it takes to trigger each key is a mere 50 grams of force, meaning commands are virtually executed as fast as your fingers are able to act, and in some cases, faster than the enemy can react, which might even draw claims that you are cheating, or that your gameplay when viewed later on, could almost border on the psychic. The thumb-pad itself can be used for movement or as a modifier for endless combinations, and it would not be too hard to believe that gamers who have not given the Razer Orbweaver a go before would be loathe to part with it in the future. The asking price has been set at $129.99 for the Razer Orbweaver, making this a purchase that is not necessary, although it would be more than a welcome to any gaming peripheral arsenal.